I recently noticed some confusion on the difference between fine motor and handwriting skills when I was doing some research for my upcoming fine motor skills book. I decided to address this in a way that I hope makes sense and educates on the which fine motor skills are important for handwriting. You have probably seen many news stories about how many children are now entering Kindergarten lacking in fine motor skills which significantly affects how they are able to participate in the classroom. Referrals to Occupational Therapy are up and many in the school system are noticing this overall lack of fine motor skills. It's important to remember that fine motor skills not only affect handwriting, but all classroom activities and skills. 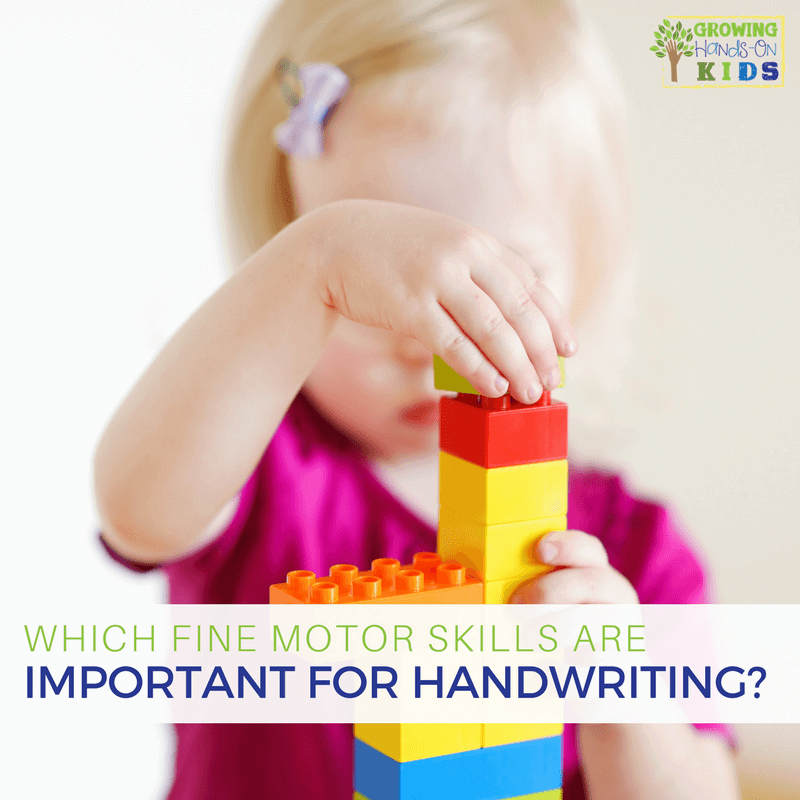 While handwriting tends to be where many notice a concern with fine motor skills, it is not the only red flag. I will address this more below as well. To understand the relationship between fine motor skills and handwriting skills, we need to look at some basic definitions. Handwriting is a complex skill of using language by pencil grip, letter formation, and body posture. There are many skills involved in handwriting including vision, eye-hand coordination, muscle memory, posture, body control, as well as pencil grasp and letter formation. Fine motor skills can also be described as dexterity and involves the coordination of small muscles and movements of the hands, fingers, and eyes. Fine motor skills development starts with basic grasps like the palmar grasp and then the pincer grasp and eye-hand coordination. In order for mastery in handwriting you need gross motor skills, fine motor skills and visual motor skills to be integrated. What Fine Motor Skills Are Needed for Handwriting? Handwriting is such an important skill to have for future reading, communication and written expression. This is why it is important to make sure the building blocks for handwriting are solid. While you do need a solid base of fine motor skills in order to complete handwriting tasks, they are not one in the same. 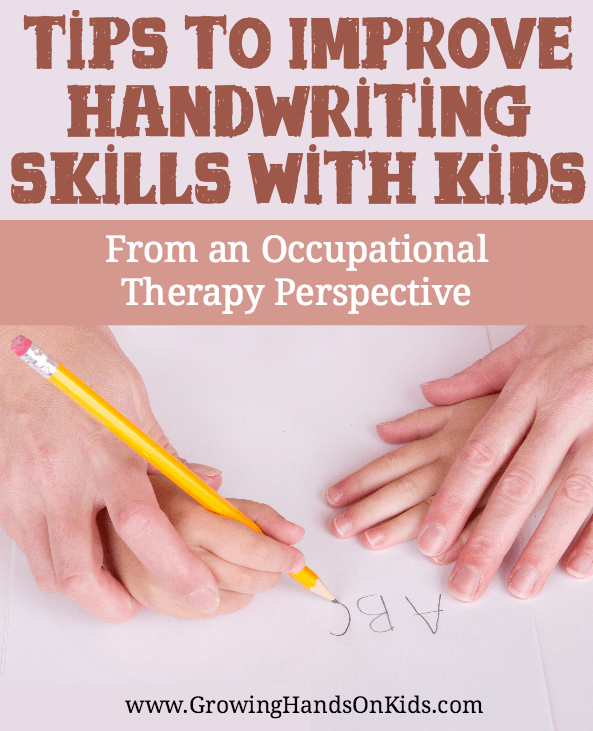 While handwriting difficulties often stem from a decrease in fine motor skills, there are also many other areas that therapists or teachers need to consider when addressing handwriting difficulties. A very common issue that many parents or teachers notice with handwriting is an incorrect pencil grasp. It has been commonly believed that a poor pencil grasp leads to poor legibility in handwriting. However, some research suggests that there may not be a significant effect. The most significant fine motor skill that can be connected directly to poor handwriting skills is in-hand manipulation. This refers to the skill of picking up an item and being able to move it around in your hand, or manipulate it. In some studies, it appeared that in-hand manipulation skills had a significant effect on letter formation, which in turn had an effect on writing tests. Another study that looked at children with fine motor delays and those with typically developing fine motor skills found that children with delays, had less than efficient in-hand manipulation skills. The children with delays ended up needing more time and dropped items more frequently or required external help for stability in order to complete their writing tasks. While strong fine motor skills are needed for a good pencil grasp, there could also be sensory concerns or visual motor concerns. Proprioception is the sense of knowing where your body is in space and has a direct connecting with knowing how much pressure to place through an item. This affects pencil grasp since a child that needs a higher amount of proprioceptive input, may not recognize how much pressure to place through their writing utensil. Visual motor concerns with handwriting include knowing to start from the top to bottom and left to write when forming letters and/or sentences. 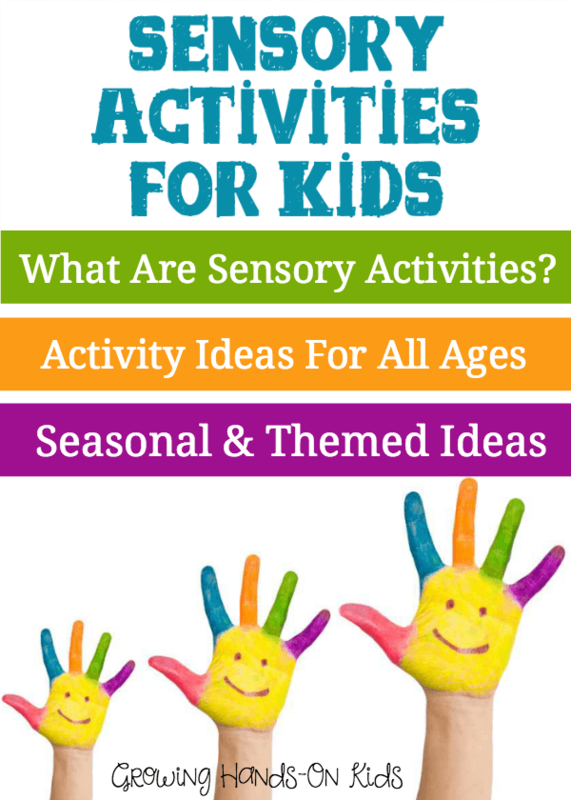 It is important to address these areas along with all fine motor activities. It is also important to remember that children are still figuring out which hand is dominate between the ages of 2 and 4 and may not fully develop until age 6. Many are also not ready for handwriting until age 6 or 7. This will have an affect on how they hold the pencil, as the dynamic tripod grasp is not developmentally appropriate until age 4-6. It is important to rule out all of these concerns while addressing handwriting. This is also why it is important to have your child assessed by a professional, like an Occupational Therapist, so they can address all of these areas and find out what exactly could be causing your child’s handwriting difficulties. Fine motor skills also affect many other classroom or home activities such as dressing, toileting, feeding, playing, and any activity that uses your hands (which means basically everything!). Children who present with decrease fine motor skills need to also focus on these basic self-help skills, not just handwriting. 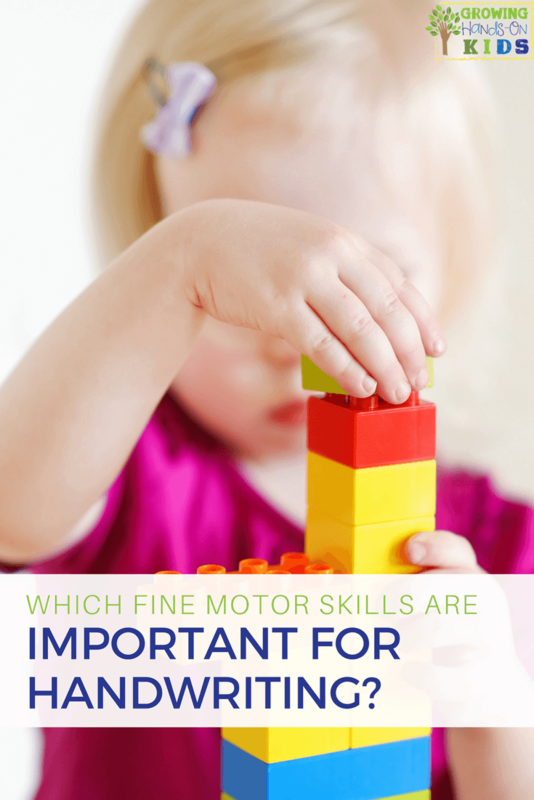 There are so many things you can learn about fine motor skills and handwriting. 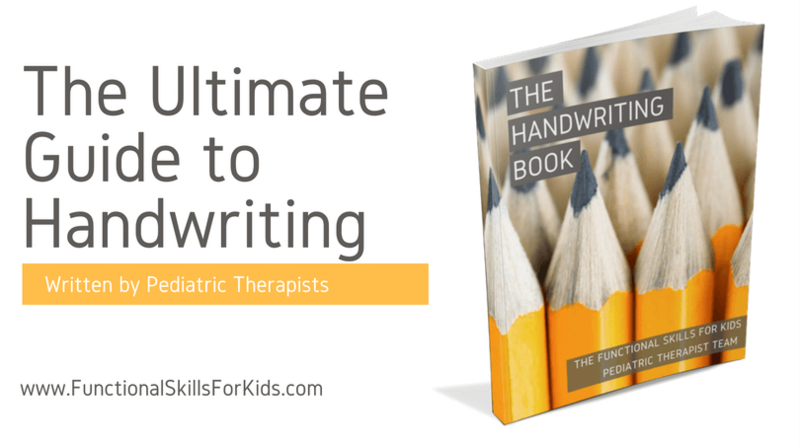 The Handwriting Book is an excellent resource, written by 10 pediatric therapists and will go into great detail on all the skills needed for handwriting that I mentioned above. During this week only, get 25% off your purchase of The Handwriting Book with the discount code: HANDWRITINGHELP1 **Valid through Jan. 29th, 2017. 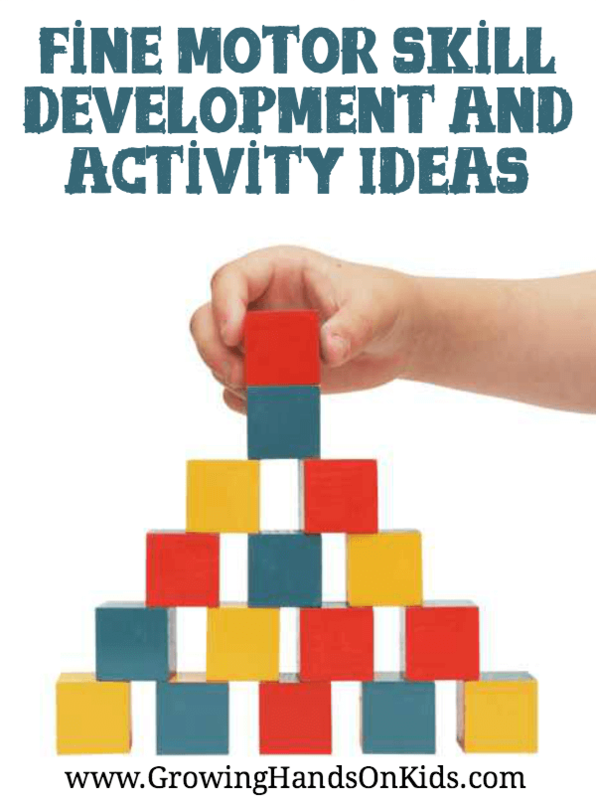 I am also working on a resource for fine motor skill basics and would love to invite you to join my 5 days of fine motor tips e-mail series. And once my new book on fine motor skills is complete, you will be the first to find out about it! Follow Heather | Growing Hands-On Kids's board Handwriting Tips and Activities on Pinterest. 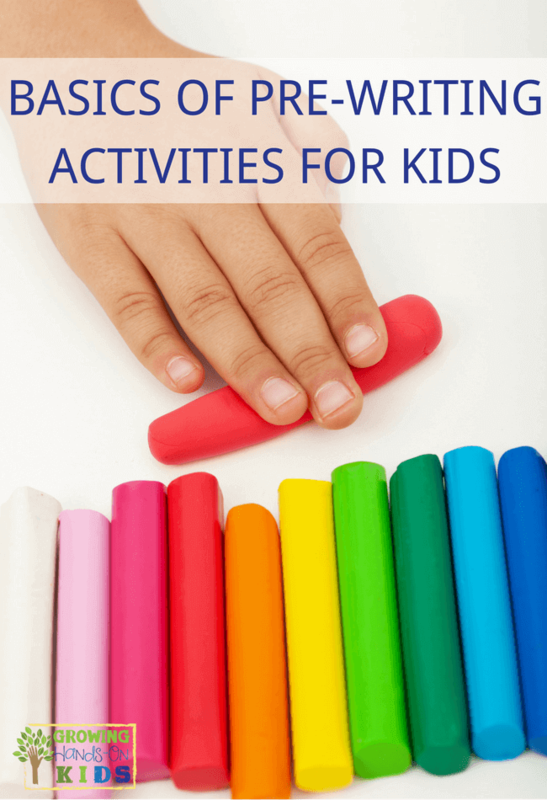 Follow Heather | Growing Hands-On Kids's board Fine Motor Skills Prek and Up on Pinterest. Burton, W., & Dancisak, J. (2000). Grip form and graphomotor control in preschool children. American Journal of Occupational Therapy, 54(1), 9-17. Clark, Gloria Jean, “The relationship between handwriting, reading, fine motor and visual-motor skills in kindergarteners” (2010). Graduate Theses and Dissertations. Paper 11399.
different-length writing tasks. American Journal of Occupational Therapy, 55(2), 175-183. Roston, K., Hinojosa, J., & Kaplan, H. (2008). Using the Minnesota Handwriting Assessment and the handwriting checklist in screening first and second graders‘ handwriting legibility. Journal of Occupational Therapy, Schools & Early Intervention, 1, 100-115. Ziviani, J., & Wallen, M. (2006). The development of graphomotor skills. In A. Henderson & C. Pehoski (Eds. ), Hand function in the child: Foundations for remediation (2nd ed.) (pp. 217-236). St. Louis, MO: Mosby. Ziviani, J., & Wilkins, J. (1986). Effects of pencil grip on handwriting speed and legibility.